Dollar is not showing any momentum against the strong JPY. This pair has been affected by the economic data in China and Japan as well. The USDJPY is falling down the descendant channel. 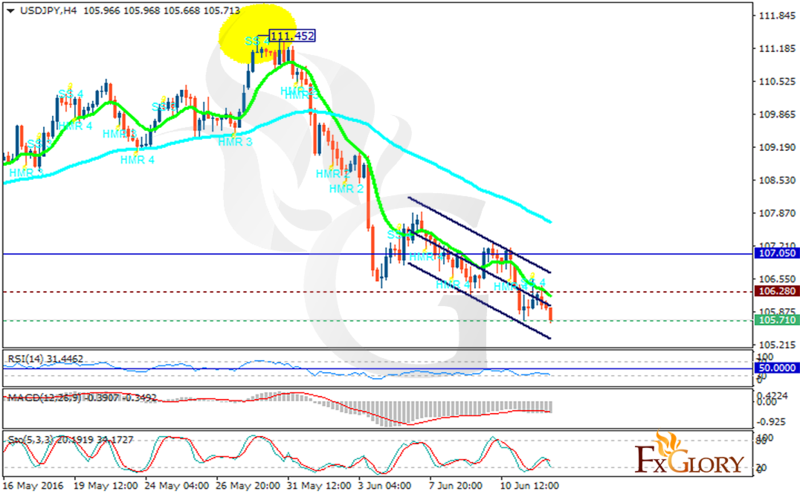 The Support rests at 105.710 with resistance at 106.280 which both lines are below the weekly pivot point at 107.050. The EMA of 10 is falling down as well and is moving below the EMA of 75 showing the recent price fall. The RSI is below the neutral area, the MACD indicator is in negative territory and the Stochastic is suggesting price decline. The pair may fall to 105.30 and after that it might bounce up to 108.00.